The normal aortic wall structure changes throughout the lifespan. The following images illustrate some of these changes. Normal aorta, 3rd trimester fetus. Left upper image. Transverse section of the aorta shows the three layers of the wall. In contrast to the adult (Figure 1) the Intima is less conspicuous. Also the boundary of the media and adventitial is less well defined. (X 50, H&E). Right upper image. The intima is a paler layer than the media. The media consists of multiple lamellar units, but only 1/3 to 1/2 in number of lamellar units present in the adult aorta (15-20). The lamellar units are highlighted by the black lines of elastic laminae. There is a distinct boundary between the media and adventitia. 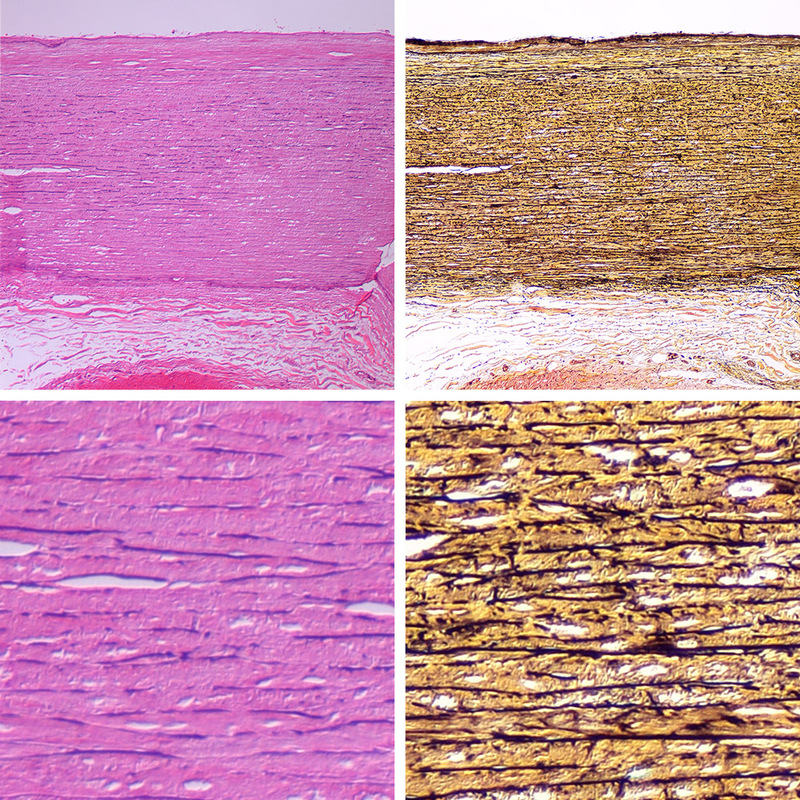 The adventitia consists mostly loose fibrous tissue (yellow) without additional elastic tissue. The vasa vasorum are present but less conspicuous than in the adult. (X 50, Movat pentachrome).Left lower image. The lamellar units are rather distinct with intervening smooth muscle cell oriented longitudinally. 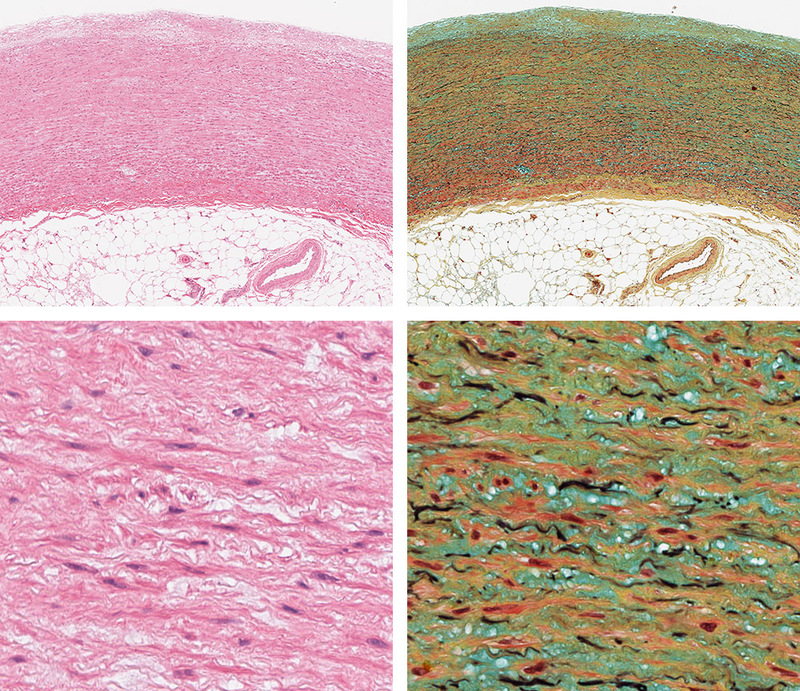 The elastic laminae are more eosinophilic and refringent than the smooth muscle cells. (X500, H&E). Right lower image.. On close up, the lamellar units are well defined, however their components are paler than in the adult. (X500, Movat pentachrome). Normal aorta, young adult. Left upper image. Transverse section of the aorta shows the three layers of the wall. Intima forms the luminal surface (top), the media and adventitia. (X 50, H&E). Rright upper image. The intima is distinctly shown as paler layer than the media. The media consists of multiple lamellar units highlighted by the black lines of elastic laminae. There is an abrupt change at the boundary of the media and adventitia. The adventitia consists mostly loose fibrous tissue (yellow) without additional elastic tissue. The vasa vasorum are distinct and of normal thickness. (X 50, Movat pentachrome). Left lower image. 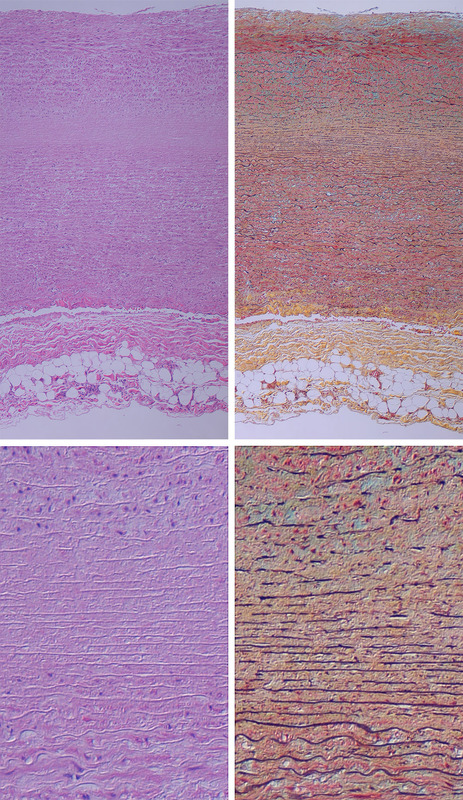 At higher magnification the media shows distinct lamellar units with slightly more eosinophilic and refringent elastic laminae. 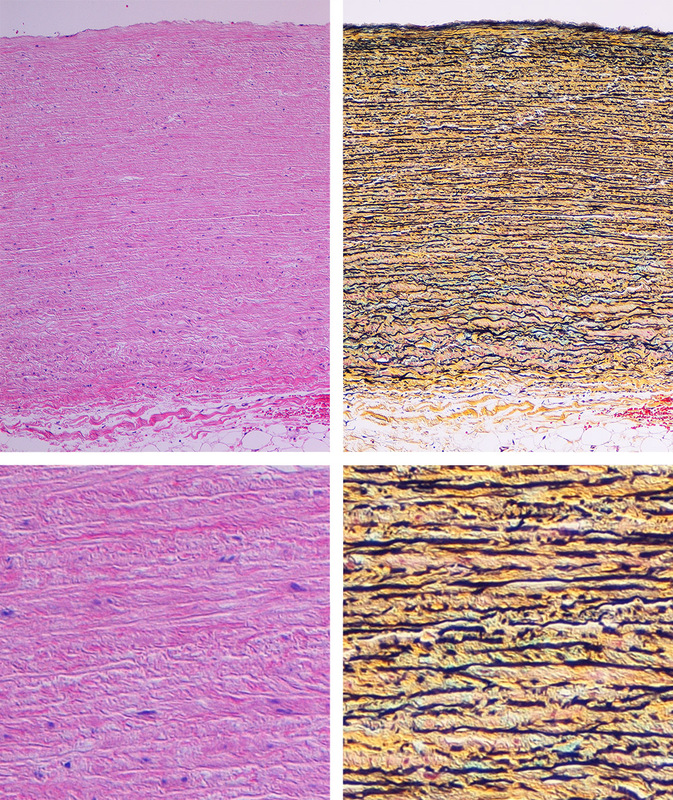 The majority of the smooth muscle cell nuclei are seen in longitudinal orientation as this is a section perpendicular to the longitudinal axis of the aorta. (X 500, H&E). Right lower image. The lamellar units in close up. One lamellar unit can be defined as the components between two layers of elastic laminae in this image. These contents are: 1. The elastic lamina itself. 2. The extracellular matrix (fibrous tissue (in yellow) and mucopolysaccharides (green/blue). 3. Smooth muscle cells (red cytoplasm and dark blue/burgundy nuclei) 4. Another set of the extracellular matrix (described in 2 above). 5. Another elastic lamina. (X500, Movat pentachrome). Aortic wall of a 79 year old man. Elderly adult aorta with mild increase of mucopolysaccharides (MEMA). Upper images. The architecture of the media shows no structural alterations at first glance. The intima is non-atherosclerotic. The adventitia is normal with normal vasa vasorum. (X50 Left image. H&E, Right image. Movat pentachrome). Lower images. The parallel array of lamellar units is intact. However the connective tissue components are somewhat altered by a slight increase in both, fibrous tissue (yellow) and mucopolysaccharide material (green) in each lamellar unit. (X500 Left lower image. H&E, Right lower image. Movat pentachrome). Medial fibrosis with some paucity or attenuation of smooth muscle cells. Left upper image.. At low magnification the conspicuous finding is the paucity of smooth muscle cell nuclei throughout the media, without lamellar collapse or discrete areas of absent nuclei. The intima and adventitia layers are normal. (X50 H&E). Right upper image. The connective tissue component of the lamellar units is predominantly fibrous, imparting an overall yellow look to the media. Notice the absence of lamellar collapse, and minimal presence of mucopolysaccharide material. (X50, Movat pentachrome). 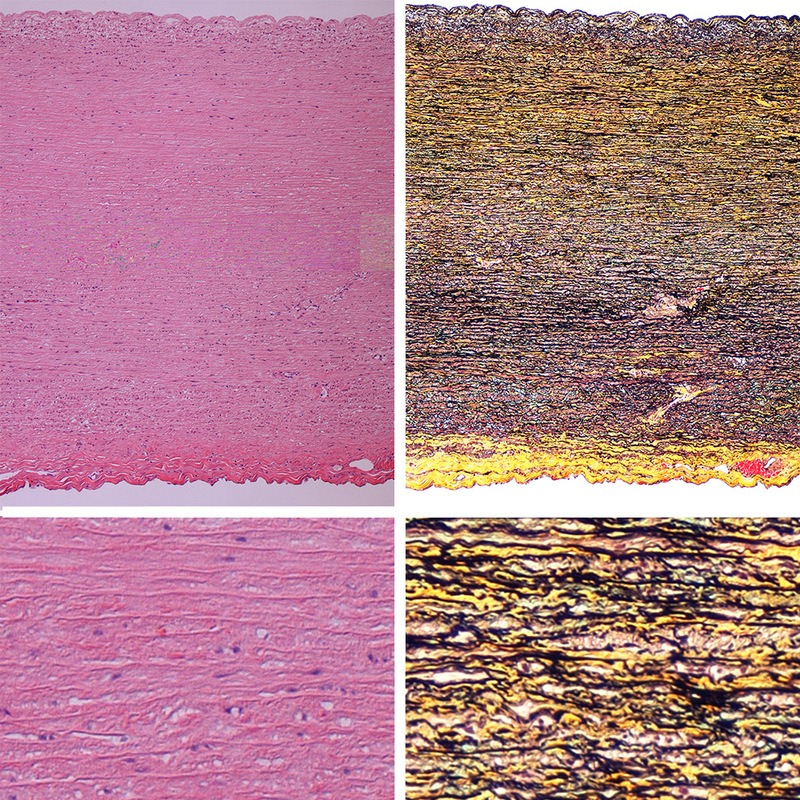 Left lower image.. At higher magnification the media shows thinned smooth muscle cells in smaller numbers the normal aorta (Figure 1C). (X500, H&E). Right lower image.. The connective tissue component is clearly predominantly fibrous. The lamellar units are clearly show in longitudinal orientation with respect to the axis of blood flow through the aorta. (X500, Movat pentachrome). 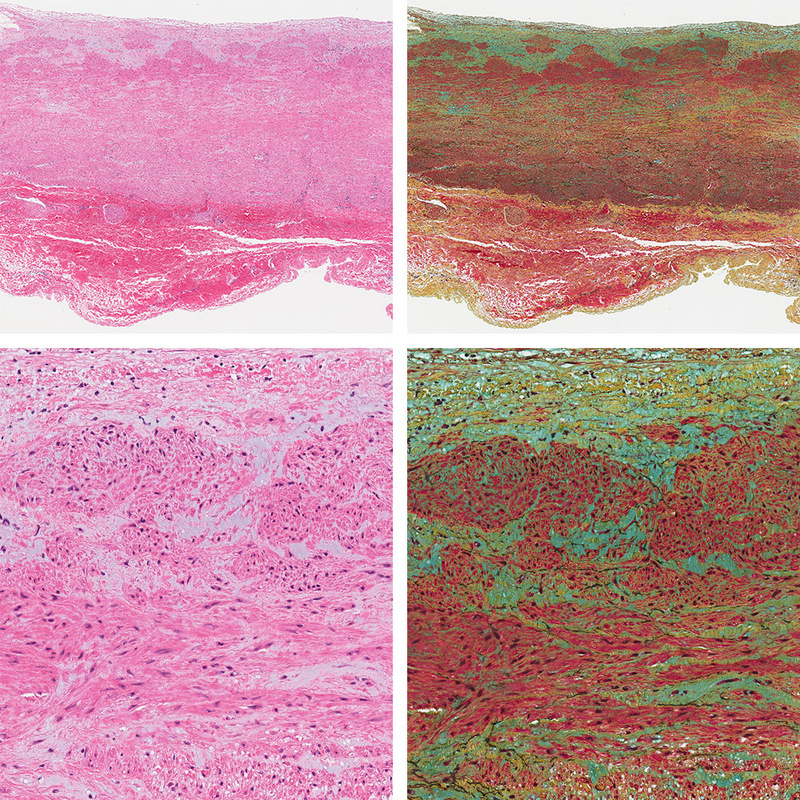 Mild medial fibrosis without cystic medial degeneration or loss of smooth muscle cells. 90 year old with lamellar loss and fibrosis of the media. Left upper image. The adventitia shows mild mononuclear infiltration. The media is very thick showing normal alignment of the elastic lamellae in the outer (sub-adventitial) third of the media. The reminder two thirds of the media show disarray of the bundles of smooth muscle cells. The intima shows moderate atherosclerosis (Grade III of the American Heart Association). (X50, H&E). Right upper image. The extracellular matrix of the overall media is rather fibrotic (yellow). The parallel array of elastidc lamellae is almost completely destroyed through out the media. Small pools of mucopolysaccharides are visible. 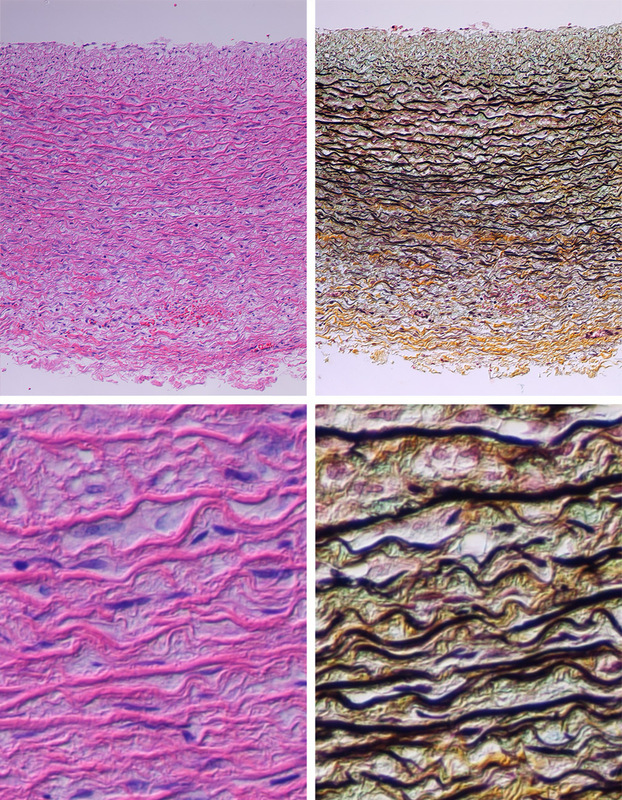 (X50, Movat pentachrome).Left lower image.. Close up of the media shows distinctly the areas of disarrayed orientation of the smooth muscle cells. (X500, H&E). Right lower image. The extracellular matrix shows, marked fragmentation of the elastic laminae. The lamellar units are no longer organized as units. There marked haphazard fibrosis moderate accumulation of mucopolysaccharide material. (X500, Movat pentachrome. Paucity of smooth muscle cells in the media. 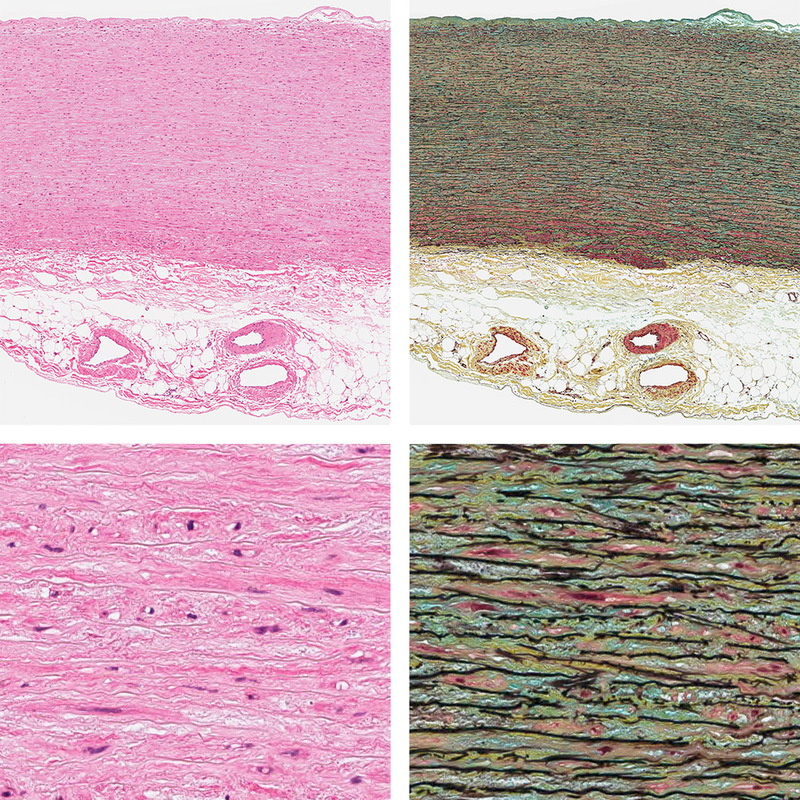 While there is not laminar necrosis with lamellar collapse, there smooth muscle cells are smaller than normal and more scarce, predominantly in the middle and inner thirds of the aortic wall. Laminar necrosis of the media. This change affects the smooth muscle cells in the middle third of the media. 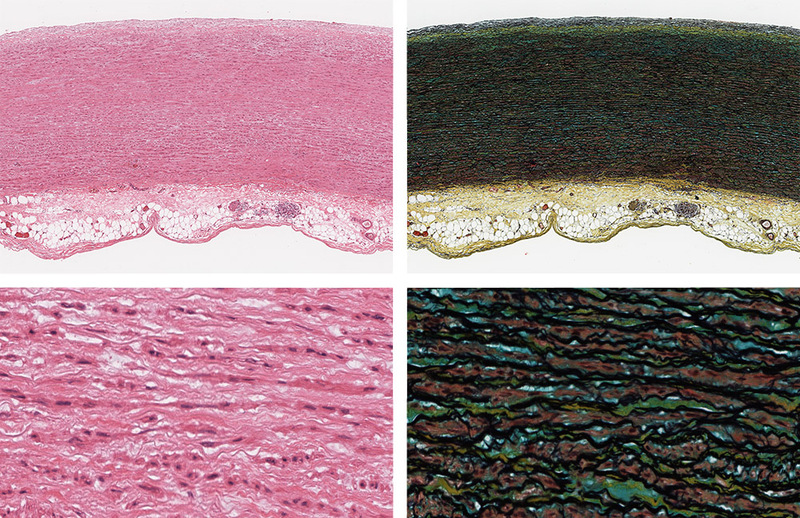 There is no disruption of elastic lamellae and no inflammatory infiltration. Left upper image. 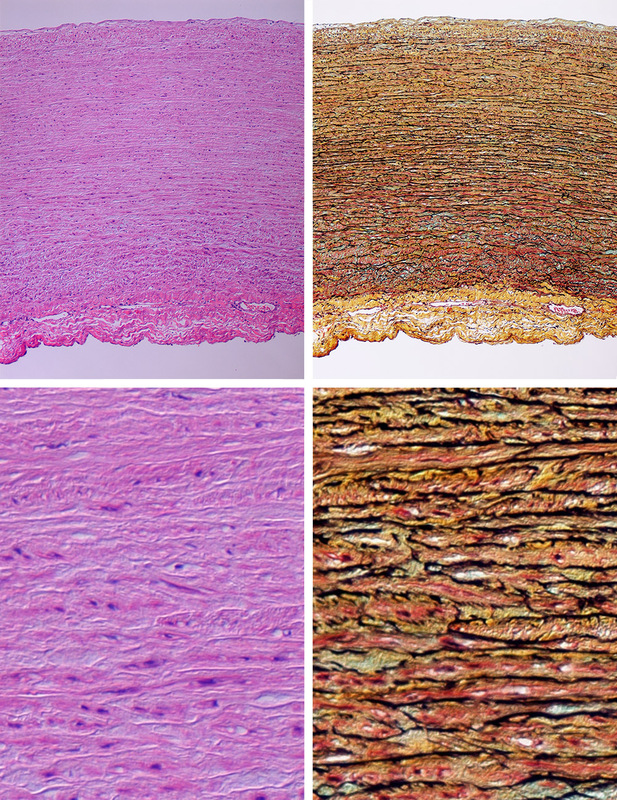 At low magnification the aortic media shows a distinct area (at the junction of the middle and inner third of the media, where there is a pale eosinophilic region without the basophilia of the nuclei. The intima and adventitia are normal. (X50, H&E) RIght upper image. 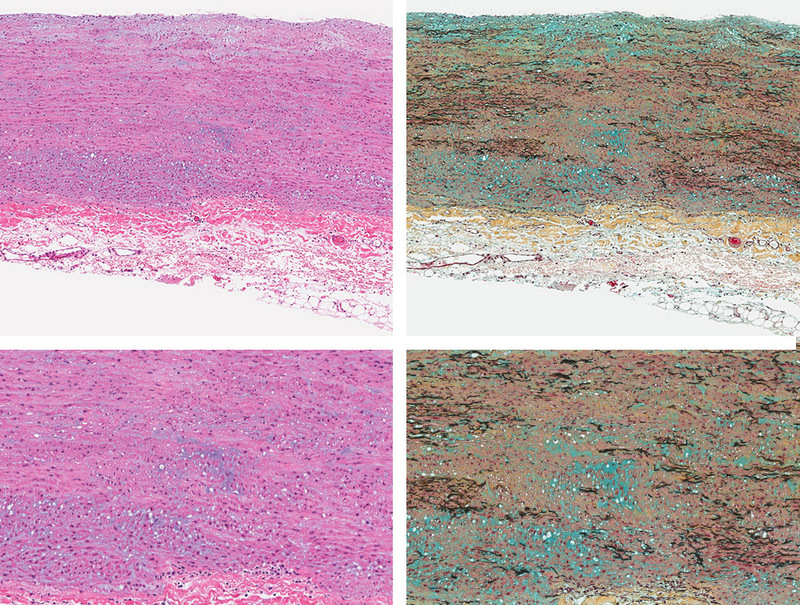 The connective tissue stain shows a distinct absence of smooth muscle cells in the area that was pale on the H&E stain. 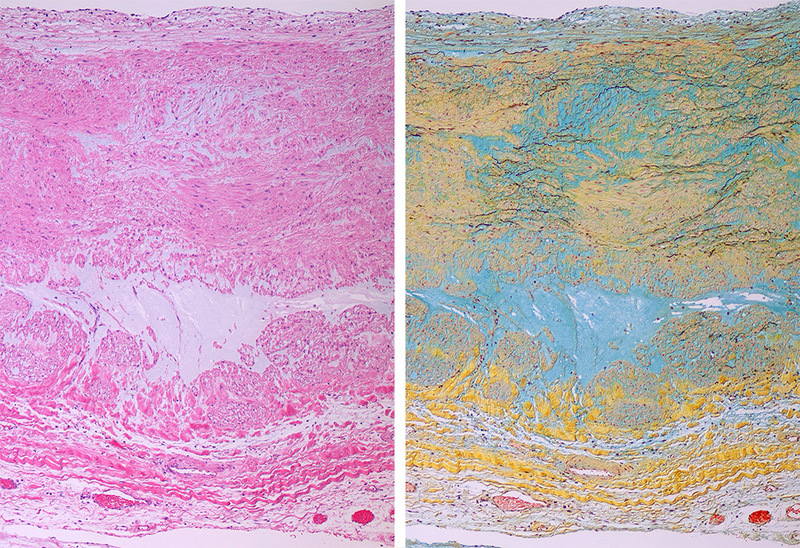 The lamellar units are closely packed and the intervening shortened interlamellar space is fibrotic (yellow). Left lower image. This close up of the pale are shows lack of smooth muscle cells and nuclei and the birefringent elastic lamellae show slight fragmentation. (X500, H&E). Right lower image. In the same area, the connective tissue is predominantly fibrous (yellow). Note the presence of smooth muscle cell cytoplasm (red) and nuclei in the areas of the media above and below the area of laminar collapse. 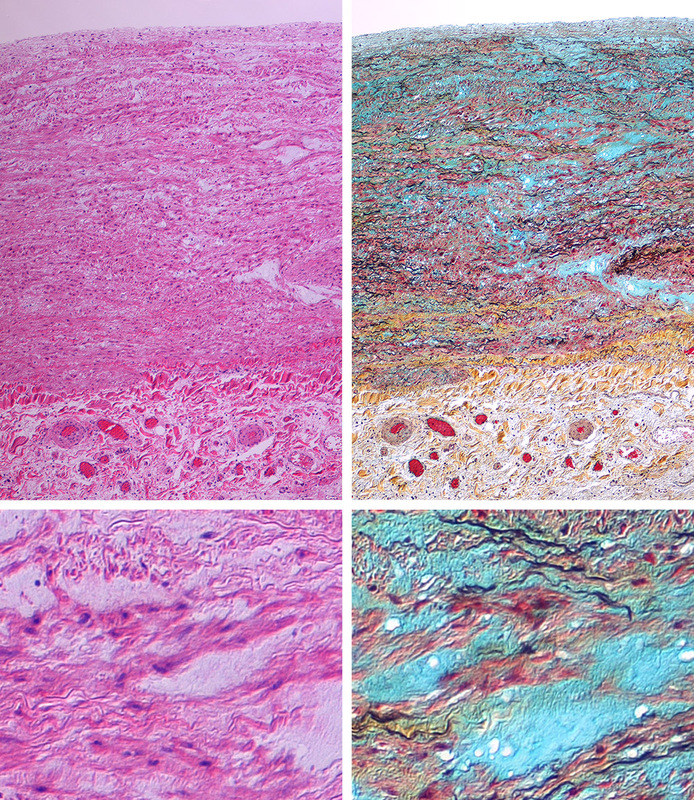 Cystic medial degeneration with pools of mucopolysaccharides. Left image. Translamellar accumulation of mucopolysaccharides forms large pools in the media. These pools involve more than 1/3 of the thickness of the media. (X500 H&E) Right image.. The same area of the aorta clearly shows large gaps in the elastic lamellae throughout the media. 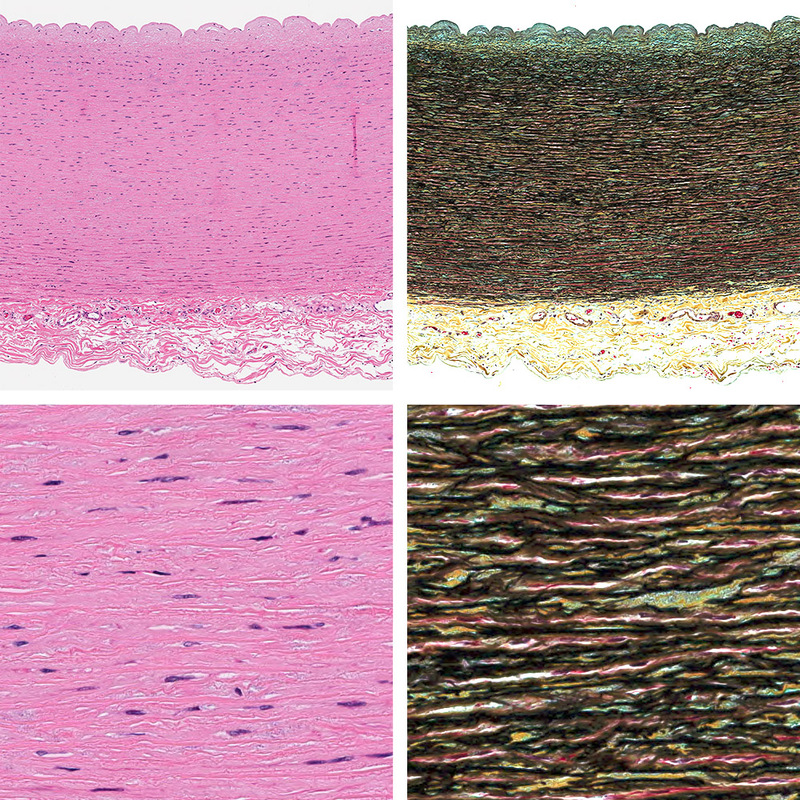 The intima and adventitial layers are completely normal. The vasa vasorum are also normal. (X500 Movat pentachrome). 17 year old with marked smooth muscle disarray and lamellar unit loss. Normal aorta, young adult. Left upper image. Transverse section of the aorta shows the three layers of the wall. Intima forms the luminal surface (top), the media and adventitia. (X 50, H&E). Rright upper image. The intima is distinctly shown as paler layer than the media. The media consists of multiple lamellar units highlighted by the black lines of elastic laminae. There is an abrupt change at the boundary of the media and adventitia. The adventitia consists mostly loose fibrous tissue (yellow) without additional elastic tissue. The vasa vasorum are distinct and of normal thickness. (X 50, Movat pentachrome). Left lower image. At higher magnification the media shows distinct lamellar units with slightly more eosinophilic and refringent elastic laminae. The majority of the smooth muscle cell nuclei are seen in longitudinal orientation as this is a section perpendicular to the longitudinal axis of the aorta. (X 500, H&E). Right lower image. The lamellar units in close up. One lamellar unit can be defined as the components between two layers of elastic laminae in this image. These contents are: 1. The elastic lamina itself. 2. The extracellular matrix (fibrous tissue (in yellow) and mucopolysaccharides (green/blue). 3. Smooth muscle cells (red cytoplasm and dark blue/burgundy nuclei) 4. Another set of the extracellular matrix (described in 2 above). 5. Another elastic lamina. (X500, Movat pentachrome).